We are happy to announce that we have added Berger Bullets as one of the official sponsors of Forgotten Weapons. Berger makes an excellent lineup of match-grade bullets for competition, hunting, and tactical use. They are a favorite of serious competitive shooters, and will serve you very well whether you are dropping prairie dogs at 500 yards or bullseyes at a thousand. Welcome aboard, Berger! Since we are on the subject of projectiles and ammo, I thought I’d add an old ammunition catalog to the document archive here. Specifically, a 1926 catalog published for the 50th anniversary of the Fiocchi company, which we received from our friend Hrachya. Fiocchi is still around today and while they make ammo for some less common old firearms, they certainly don’t have everything that was stocked back in the 20s. In addition to the common sizes recognized today, you could also get shotshells in 14, 24, and 32 gauge. Pinfire ammo from 5mm to 15mm. All manner of revolver and pistol cartridges long since gone, and a lot more offerings of .22 rimfire than we have today. Many thanks to Berger Bullets for supporting this Great site !!! Take a look at huge 32mm shotshell (pages 25 and 27). 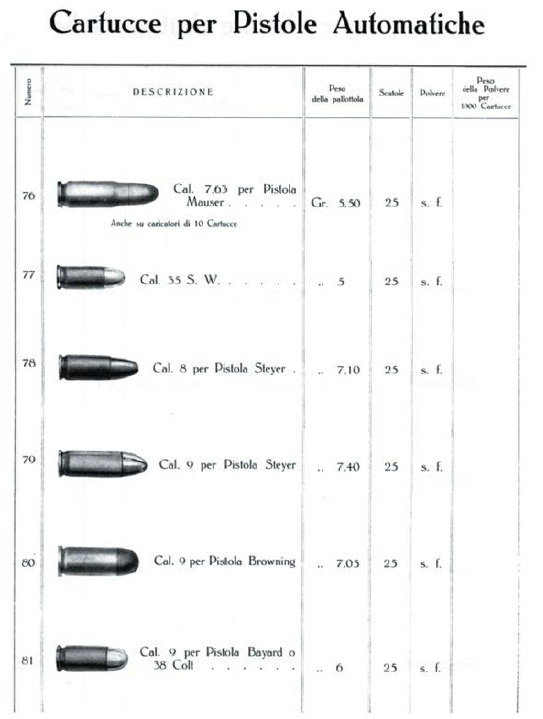 Note, that it is not 32gauge, but 32 millimeter (almost 1,25″) diameter shell !